Die, Fluffy Wuffy, Die! 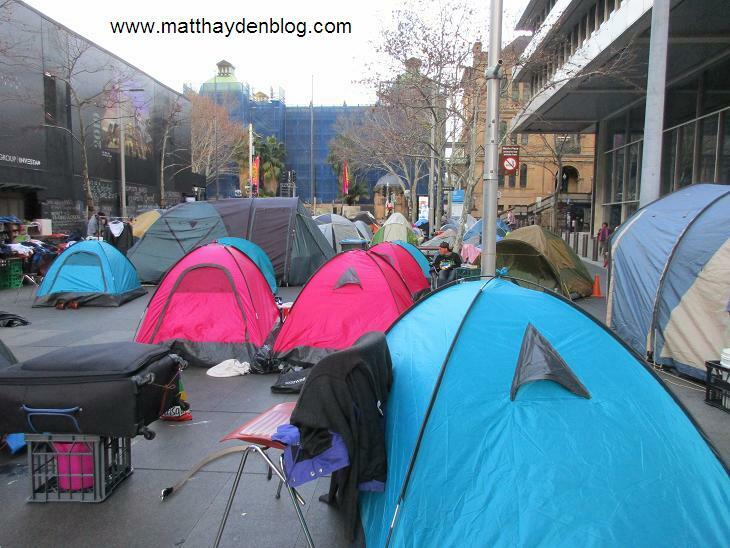 : Intensity in tent city: Clover Moore gets Sirius! 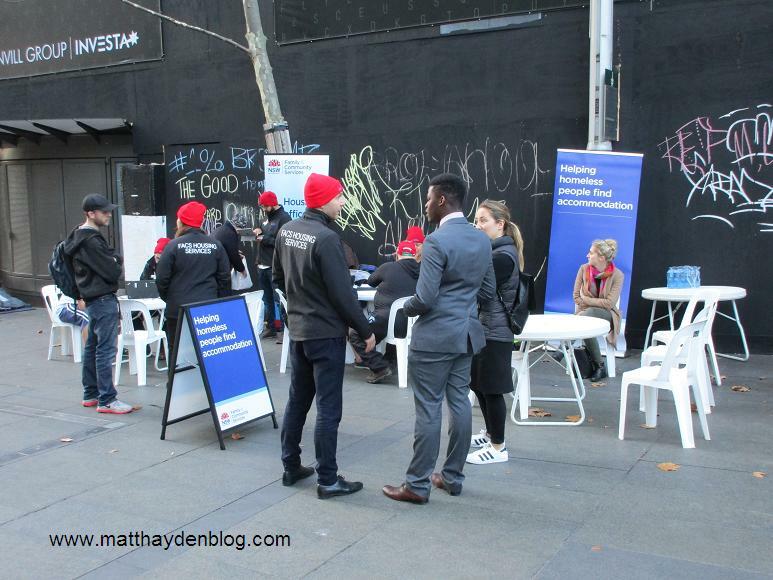 This conflict over the homeless camp in Martin Place is getting more and more intense. It's a battleground between two levels of government, neither of which wants to do anything decisive about it. Basically, it's a grudge match between Lord Mayor Clover Moore and Premier Gladys Berejiklian. 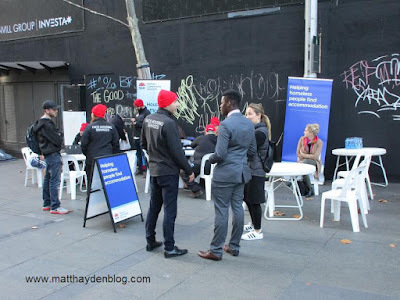 Clover and the City of Sydney seem to be quite enjoying the fact that many NSW State Government pollies have to plod through this squalor everyday on the way to the "Bear Pit". It's right near Parliament House on Macquarie St, after all. I suspect they might feel very different if the camp were located right outside Town Hall, where the City of Sydney offices are housed. The fact that it's not there is telling ... Now, I'm not saying that Clover had a hand in this from the beginning. But it certainly suits her agenda, which is to push for more social housing. She wants the Sirius Building, now nearly empty, to be re-opened, along with more social housing. 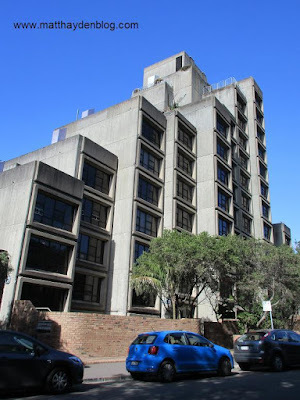 This striking structure was slated for demolition a while ago to make way for massive apartment blocks. Then it had a reprieve, so there's been this almighty push to keep it there, and honour the spirit in which it was originally built. Now, I know that greedy developers have been the scourge of NSW politics for ages. 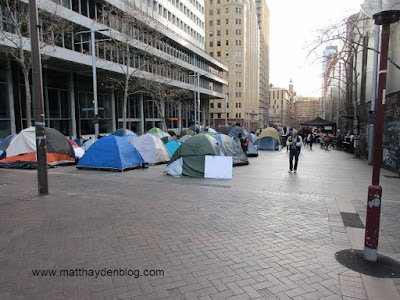 Still, I sympathize with the State Govt on this issue and understand why they don't want to fill it with the homeless. The site just has waaay too much earning potential! Right next to the Coat Hanger in The Rocks, it's gotta be one of the most valuable pieces of real estate in all of Sydders! It'll be a shame to see it go. But capitalists are gonna win there eventually, I suspect. But at least for now, Clover's kinda got Gladys cornered. 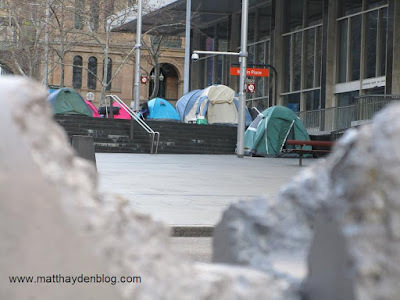 By not removing the Martin Place homeless camp herself she makes the Sirius option more likely. The State Govt don't want to send in the plods to clear the campers out because they know all the local lefties and their fellow travellers in the media will cry "fascism!" Another thing I don't like about the camp: Activists have been pushing this line that it's just kinda sprung up organically. 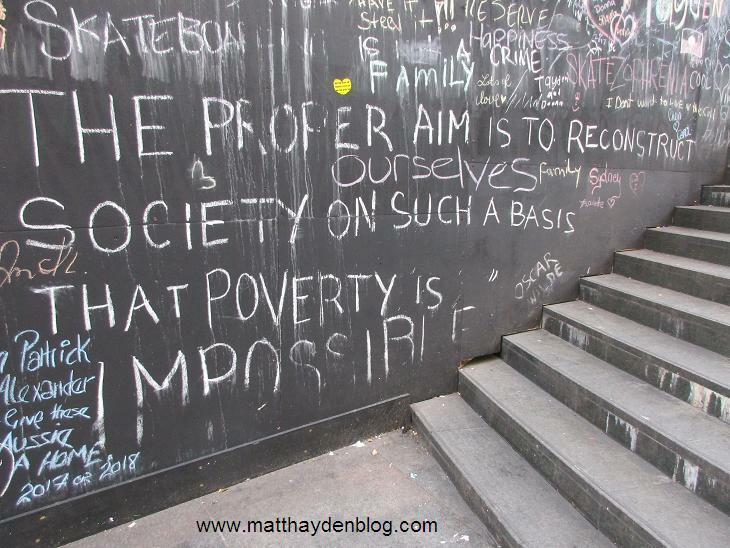 It's supposed to be an inspiring example of the ingenuity of the oppressed. To be honest, I originally thought this was the case myself. 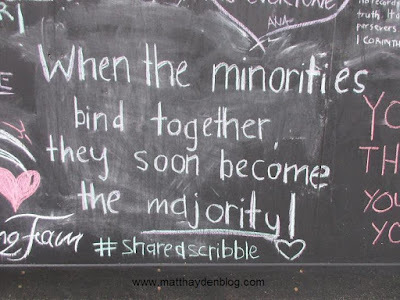 I wrote a blog post about it a few weeks ago, remarking on its seeming self-sufficiency. But lately I've come to the view that there's little that's truly organic about it. Whether it's been engineered by the Occupy Sydney crowd or not, it is certainly reminiscent of their tactics. 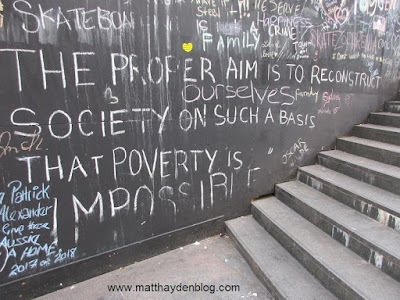 Also, if you look closely at the graffiti there, it's pretty clear that much of it has been written by activists, not the homeless themselves. Also, consider the context. This is now Homelessness Prevention Week. Timing is perfect, innit? Sydney's Lord Mayor herself even claims she's not being political, while including the hashtag for that actual campaign! And another thing: Not so long ago the City of Sydney placed terrorism prevention barriers right near where the camp is located, basically on the next block down. My question: If Clover was so concerned that this area was likely to be a target for vehicular terrorism, why no new bollards to protect the tent city specifically? True, there's no point in putting them at the western end of the block, since it's protected by stairs. 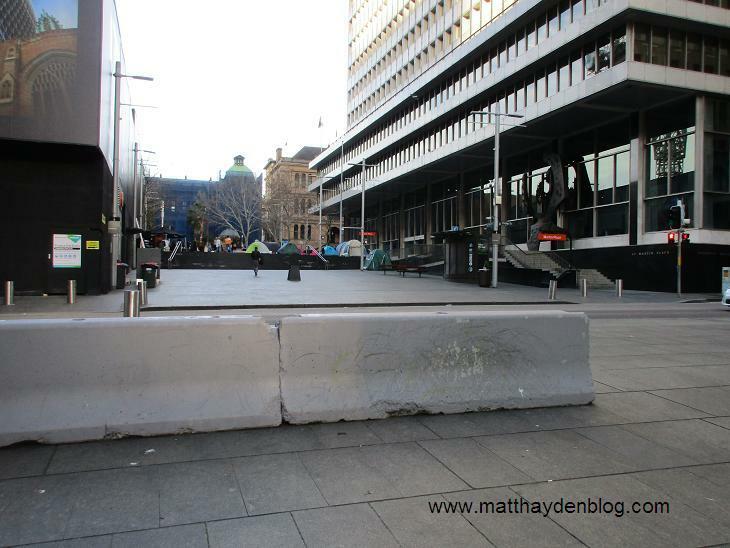 Still, on the Macquarie St side it's remarkable that there are no concrete barriers. Yes, there are a coupla telegraph poles there already, but there's still easily enough room for a truck to drive through! And surely a bunch of homeless people in tents would be far more vulnerable to such an attack than pedestrians, right? If, as her fellow traveller Sam Dastyari says, you can judge a society by how it treats the most vulnerable, then surely this omission reflects poorly on her, doesn't it? Anyhoo, that's my two cents ... For a closer look at what it's like in the camp here's a video I made a few days back. UPDATE: Decision has been made to dismantle the camp, starting tomorrow.